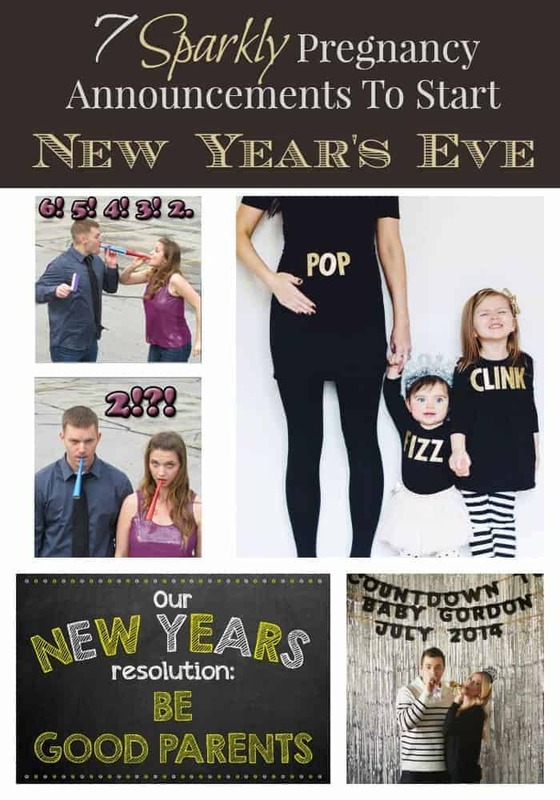 New Years is a great time to share your pregnancy announcement with your family and friends. The holiday is already full of sparkle, fireworks and celebrations. There is no better time to announce a pregnancy with a little bit of extra sparkle and pizzazz! I’ve scoured the web and have found some genius pregnancy announcements you are going to want to see, and save for later! Which announcement would you like to try? Did you announce your pregnancy during New Year’s Eve? Tell me about it in the comments! Source: Freckled Shenanigans Studio. You can find them on Facebook! 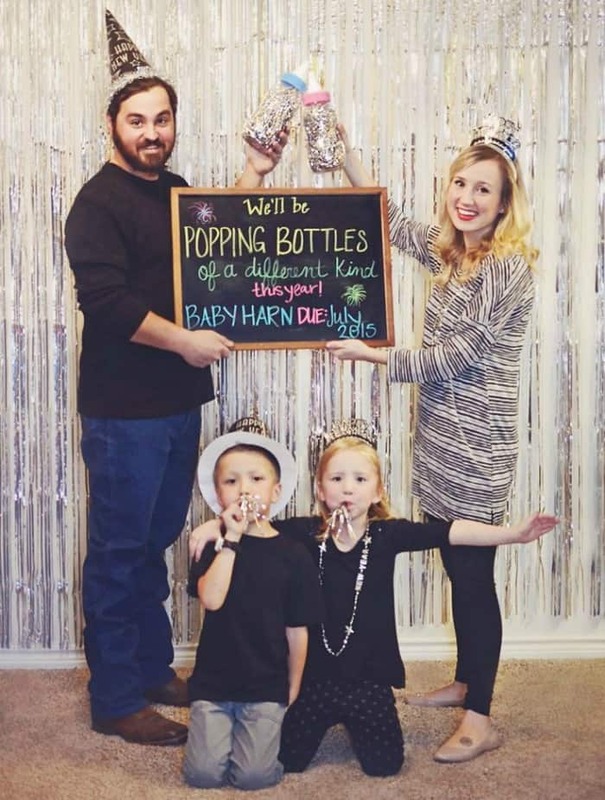 You might find with a baby on the way that you may be popping more grape juice than champagne this year. Let your family know a big change for the New Year is cause to celebrate! This family went all out for this cute announcement. These stylized shirts for mom and the kids are a super adorable way to announce a new baby is on the way. I love the super graphic feel, and the kid smiles in this picture just add to the excitement. 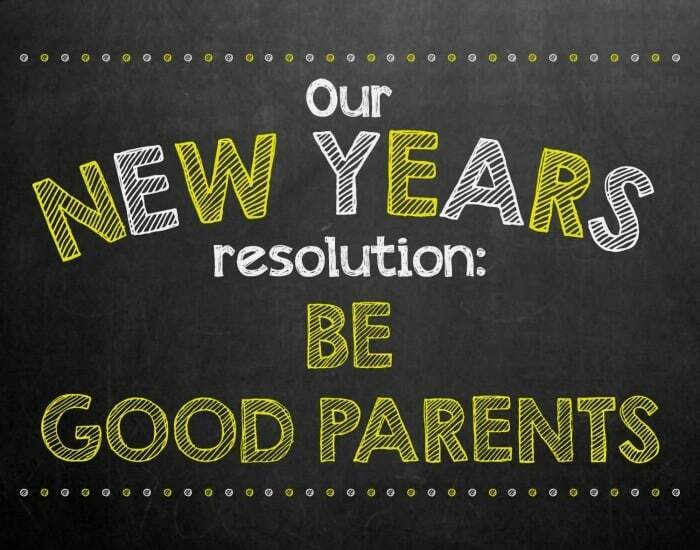 This sly chalkboard style announcement will let all of your friends and family know that your New Year’s resolution this year is to “Be Good Parents.” I think this announcement is especially adorable for a first pregnancy. We have you covered with Great Free Pregnancy Announcement Cards to help start your New Year’s budget off right! Sometimes a surprise is made even better with a small gift. Take a bottle of wine over to your family or close friend’s house for New Year’s with this super cute gift tag. Everyone will be so excited when they read the tag to see what bottle you brought to share! 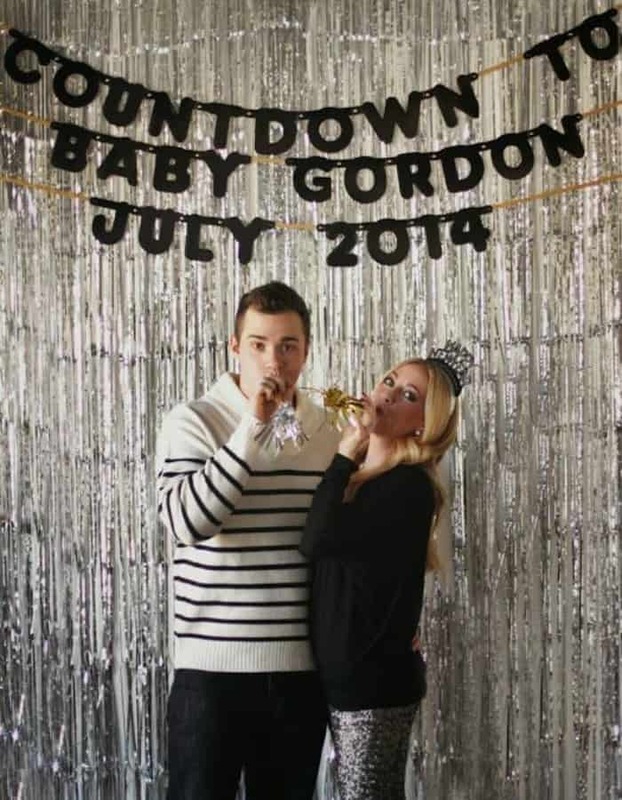 This couple is adorable with their countdown party announcement! This is an announcement I think would be really easy to pull off, with such a cute result. I do have to admire those sparkly silver pants that this gal is rocking for the celebration. 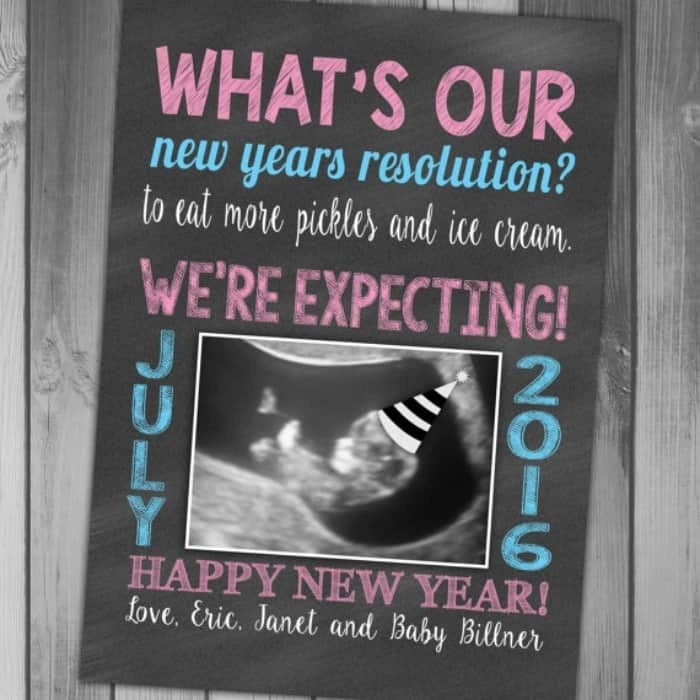 Give the traditional sonogram picture a New Year’s spin! This is an adorable way to include your sonogram picture into an announcement card. That baby is surely having a party worth sharing in your belly, and if you don’t feel the party now you sure will soon! This is an adorable card! Having twins? This picture series is a great way to announce that you will be counting down to two instead of one this year! The surprised look on the couple’s face is priceless! Looks so pretty! Very clever too, I wish we had done something like this! i love this. what an awesome way to announce having a baby. what creative and innovative ideas. These are such cute pregnancy announcements!! I wish Pinterest had been around when we announced ours, would have been fun to make a announcement like these! These are great pregnancy announcements. People are getting so creative with these. I love when people come up with fun announcements like these! These are really cute ideas. This is super cute! I wish I had done something like this with my babies. I love all of these how fun. I never did anything fun and I really regret it. I have an idea if I ever get to do it again! 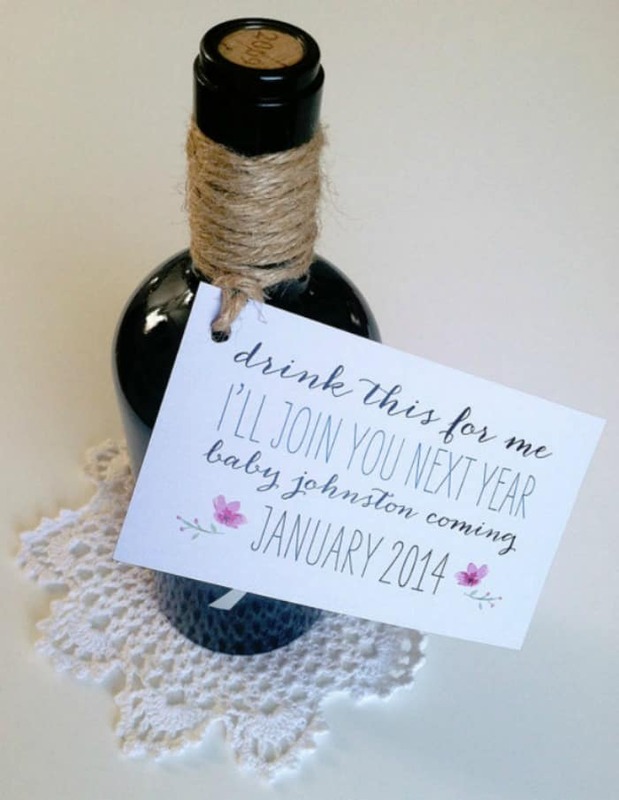 These are such cute announcement ideas! I never did anything special like this with my girls. I’d love to do something like this if I have another. I love the “pop open a bottle” one. Cute! What darling pregnancy announcements! My friend just announced her pregnancy today, so exciting! Those are so cute! I love seeing how creative people can be with these. What cute ways to announce a pregnancy. Wish I would have thought of these when I was pregnant with my children. Such cute ideas. I never did baby announcements for any of mine. I kind of wish I had. Goodness, such cute ideas!! I love the Pop/Clink/Fuzz one. We used Anna and Elsa to announce our second baby! I was never this creative with our announcement, my SIL in the other hand did something pretty cool. I love all these ideas, they are fun and whimsical! Those are such cute announcements. I wish I’d had options like this 18 years ago when I was pregnant with my daughter. These are some really great ways to announce a new baby! I really love the wine tag drink this for me, i’ll join you next year! Awesome! 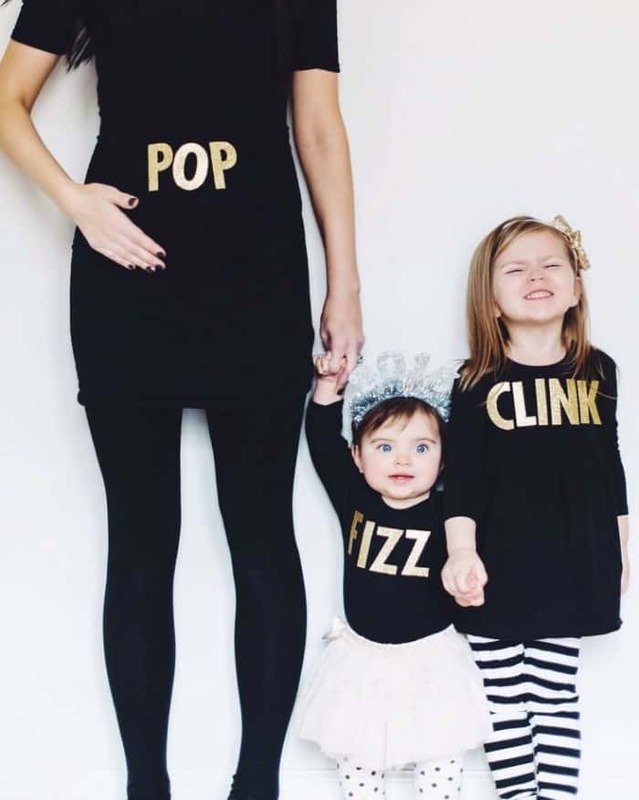 The pop clink fizz happens to be my absolute favorite. It looks super festive and will make people laugh! Super cute ideas! I wish I would have been more creative when I announced both my boys. What fun ways to announce a pregnancy! I wish I had done something like that.